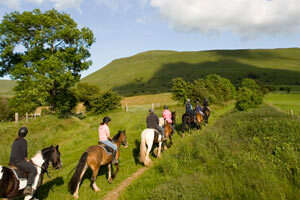 Horse Riding Holidays & Pony Trekking in the Brecon Beacons National Park in Wales. Why not come and ride the Trails on the Black Mountains and experience some of the very best mountain riding that Wales has to offer. Tregoyd Mountain Riders offer riding holidays, horse riding and pony trekking, riding on the trails of the Black Mountains within the Brecon Beacons National Park. We have direct access to the mountains from our centre and ride on the open commons and hillsides of the Black Mountains, which are in the eastern part of the Brecon Beacons National Park and have stunning views of the river Wye and the Wye Valley below with the mountain ranges of the Brecon Beacon National Park as the backdrop. We cater for all ages and abilities and are open from March to the end of October. We do have a 15 stone weight limit. We take great care in matching your riding experience, height and weight to one of our experienced, well-mannered and sure footed horses. This is why we really want to talk to you before you arrive to ensure that you have the very best tailor made ride. A half day ride is about 2 hours riding and we offer a morning and afternoon rides, 9.45am and 1.45pm start at our yard. 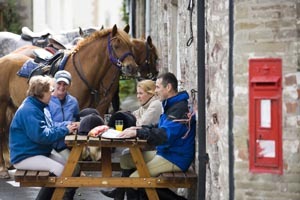 A full day ride is about 4 to 5 hours riding, and includes a pub lunch, (less drinks) or a picnic lunch. 9.45 am start at our yard. Please arrive about 15 minutes before the start of the ride. 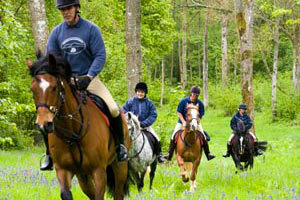 • Half day and full day Pony Trekking, suitable for complete novices and non-riders, walk with an occasional trot. 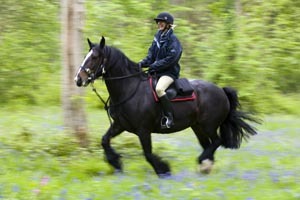 • Half day and full day Hacking, for experienced riders only, walk, trot with more and faster canters. • Riding holiday packages, combining self-catering accommodation with riding from 2 to 7 days. • Pony Paddock, a 20 minute lead rein for our youngest riders. Limited availability.